I finished up the doll quilt this afternoon and can’t wait to make another one. Here are 3 photo’s and I’m even including a close-up of the hand quilting. Except for the wonky center, it’s not too bad considering I haven’t hand quilted anything in several years AND I’ve never hand quilted without a hoop. Click on the images to see a larger view. This also counts as a UFO finish (#14 this year) since these blocks were made a very long time ago! It looks great. And I love the baptist fans on the RWB sampler, too. I have two baby quilts and another Heartstrings quilt to finish and then I’m going to play in my scraps — just for the pure pleasure of playing! 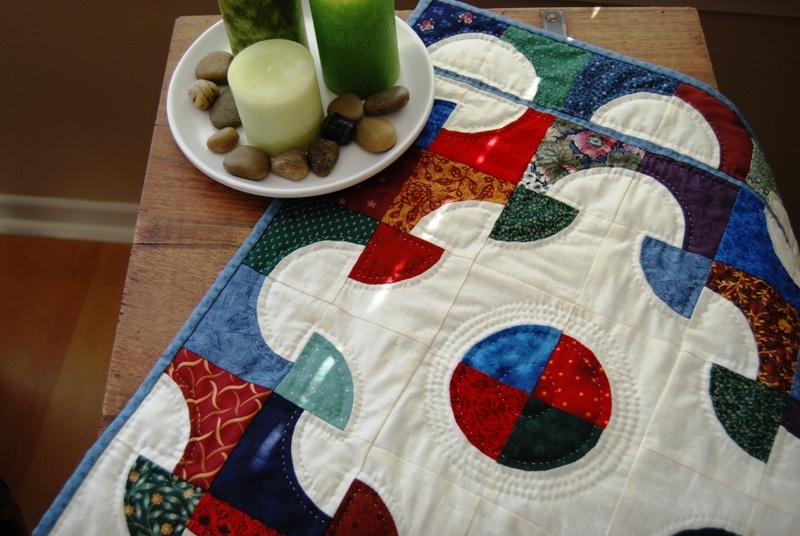 What a neat little quilt….the quilting looks great. That little quilt turned out great! I love the little inner border you put in there. That is a great idea! I love it! I really like the narrow blue border between the center and the outer row. That is seriously cute! Well done! I just love that little quilt!! And the ones on the last 2 posts. That looks great! So how many of these are you going to do?? Mary – it is WONDERFUL! Great photos, too. Mary, Your hand quilting looks fantastic. I have only hand quilted one baby quilt about a million years ago. You have inspired me to try this !!!! Very nice Mary! I really like it. 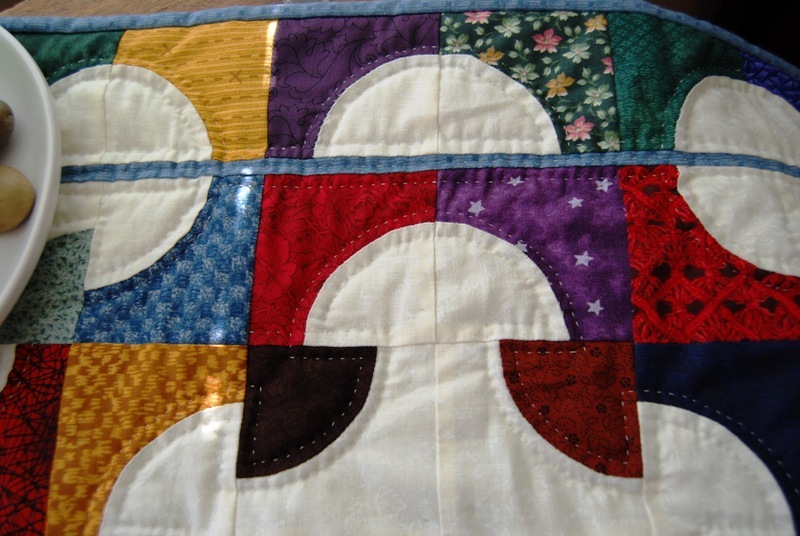 The hand quilting looks good. I think it looks fabulous! I quilt all the time and I am “Still” learning to get the stitches consistent. Looks wonderful! Ahhhhh the doll quilt is too adorable. It’s sooo pretty. I love the thin blue lines. Its so simple but adds a lot to the quilt. Lovely! I love your small quilt. The colors are fantastic.Have fun in Key West. The B&B looks absolutely wonderful. 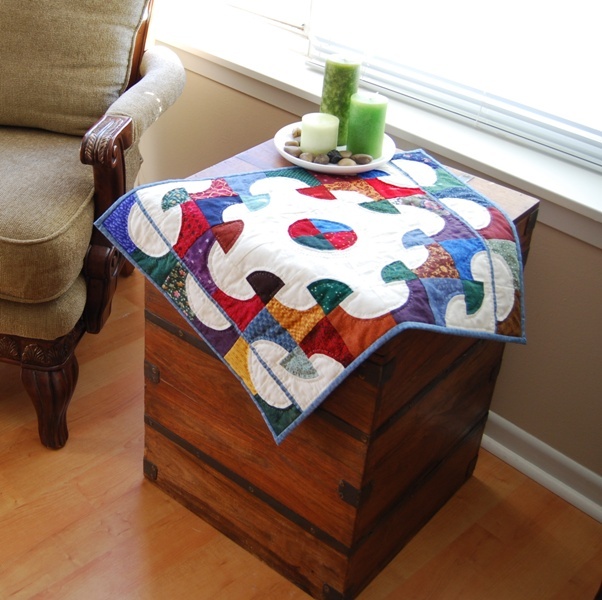 Mary, your quilt and quilting turned out so nice. I’ve always wanted to do that pattern, especially scrappy.